I don’t remember the first bonsai tree I ever saw, or what exactly it was that sparked my interest in little trees, but I definitely remember my first trip to the U.S. National Bonsai and Penjing Museum in D.C. I was amazed at the shrunken trees, and if you’ve been following my blog you’ve probably noticed that the majority of my pictures were taken at the museum. As a child I didn’t understand very much about the process behind creating bonsai, or the history of the trees in the museum, but I was certainly amazed. Of particular interest to me was the swirling, twisting, white parts on some of the trees. I remember thinking that the thick pads of foliage looked as if they were being tossed around in a frothy ocean. At first I thought they were rock plantings, or carved stone of some sort. Maybe it was just a species of tree that grew multi-colored bark? When I realized it was part of the tree, carved and bleached, I was able to see bonsai as an art, not just growing little trees. I don’t like to get involved in the politics of bonsai. For those of you that know me personally, it’s the main reason I’m not a member of any bonsai clubs. All I really want is to do is make my trees the best they can be. While opinions will abound, there are some facts in regards to deadwood. In my Juniper post I pointed to “distinguishing features” as being a consideration in styling your tree. On Junipers, deadwood is the distinguishing feature. Why is it a distinguishing feature? Because there aren’t any old junipers in nature that don’t have deadwood. And as we all know, the whole POINT of bonsai is to make trees that appear old. 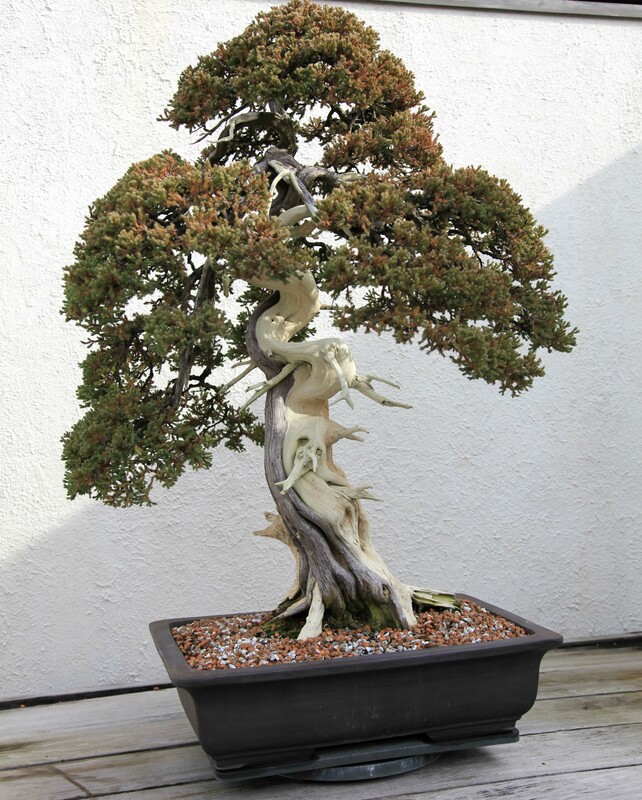 There are probably 0 famous juniper bonsai without deadwood. Another bit of food for thought, and this is where I’ll stop. We often look at bonsai as a single discipline. But I think you’ll find that in all forms of art, quality examples proliferate throughout artistic preference. What I mean is, sure, bad examples of deadwood on bonsai exist out there. But I would hope that regardless of your preference for natural or abstract deadwood, you could appreciate outstanding examples of both schools. Even if you believe bonsai should only look like trees in nature, I hope you can appreciate some Kimura trees. Ok so on to the lighter stuff, all of which I picked up from some combination of Ryan and Marco at this year’s Rendezvous. Trees are efficient and adaptable. What is the fastest distance between two points? A straight line. And so it is with the live veins on trees. If you could grow a tree in a bubble, it would be perfectly straight. The water and nutrients would run up from the roots, in a direct line to the underside of each branch. But in the real world, outside factors affect the growth of the tree. Wind, water, sunlight, other plants, and animals will all change the direction of the trees growth and it will have to adjust the direction of the live vein in order to maintain the branches. A twisted trunk did not develop by chance. Some outside factor forced it to grow that way. So if the tree you’re working on is extra twisty, how do you find the live vein? There are a couple options for determining how each branch is fueled. 1. First of all it’s important to note that the live vein for any single branch will run down from the bottom of that branch. Where it goes from there will vary, but at least initially it will go straight down. 2. This may be obvious, but as a branch grows the live vein fueling it also grows. A huge branch will have a correspondingly huge live vein. The un-balanced growth of various branches leads to trunks and roots that are un-uniformly shaped. As the live parts of the tree grow, the trunk expands, the old bark cracks and dries, and the new vascular tissue expands underneath. So here’s the tip! The direction of the cracks in the bark is the direction of the live vein. On a juniper this will be hard to see unless you have left the old fissured bark on the tree. But if you follow a single crack from the branch to the root, there’s your live vein. 3. Specifically for Junipers, if a section of tree has recently died, or the live section has not grown strongly for very long, it may be difficult to distinguish the live section from the dead. A good way to identify the live section is the scratch test. Using the tip of your scissors, or similar small metal instrument, make a very small scratch into the bark. If it separates smoothly and the wood underneath is bright white, it’s a live section. Otherwise it’s deadwood. It’s a really simple process, and it doesn’t harm the tree at all. So let’s get to work! One of the challenges with deadwood work is determining design and size. It’s especially difficult sometimes on trees that are being styled for the first time because it’s difficult to match the deadwood style with a branch style that hasn’t fully emerged yet. Just as with the rest of our tree’s design, we should still approach deadwood work with a “work with what we got” attitude. Here are a few rules of thumb when doing deadwood work. 1. Live wood is significantly easier to work with then deadwood. Don’t start styling and have the “I’ll go back and work the deadwood later” attitude. It’s much easier to get in close and work on deadwood if you don’t have to worry about accidentally misplacing a wired branch. Live wood also offers the advantage of being able to be bent, wired and hold its shape after drying. 2. A great approach for making Jin is to make your structure branch decisions early, cleaning foliage from branches you won’t need, and leaving enough branch to use for potential jin Later on. Then you can go back in and strip the bark from each branch you’d like to use as jin. Finally you can go back in and finish the branch tips by gently grasping sections with your pliers and peeling back the wood fibers along the grain. Remember, you can always take wood away but you can never put it back, so take your time. 3. Give your deadwood a few days to dry out before trying to apply the lime sulfur. Lime sulfur is a drying agent and a fungicide. It’s used to prevent the dead wood portions from rotting or getting invaded by insects. The idea is that you want to apply it to dry wood so that the wood will soak it up like a sponge. If you try to apply it freshly peeled deadwood (which is still full of water-resistant sap) it won’t soak in. Once dry, it also helps to spray the wood with a little water before applying the lime sulfur. 4. When developing shari, a good rule of thumb to remember is 50%. You can remove (generally) up to 50% of the live vein supplying any single branch without killing it. So if your desired shari line weaves over into a live vein, don’t stress too much. As long as you’re not cutting off more than 50% of the branches fuel, you should be fine. 5. Want to get an extra twisty jin but it just won’t move in the direction that you want? Try this: use trunk splitters to crack a lateral line on either side of the branch. The idea is to cut about 50-75% of the way into the branch, but not all the way through. Then make the same crack on the top and bottom of the branch. By separating these additional fibers you’ve increased your ability to twist this section of branch. After twisting and drying the cracks shouldn’t be noticeable at all. 6. Even if you don’t like to use power tools to make your deadwood, I’d recommend trying out a stainless steel brush tip for your rotary tool. It really gives that clean, smooth look to your deadwood, that’s extremely difficult to duplicate with any other tools. It can also be helpful in removing bark from already dead and dried areas of the tree where the classic bark stripping techniques do not work. It also has a smoothing effect on fresh wood, where sand paper is useless. 7. Ever wonder how they cram huge trees into small pots? In terms of trees like junipers which have significant deadwood, one strategy when developing shari is to carry it all the way down the trunk to the roots. That way, you can identify exactly which roots are needed to supply the deadwood portions, and remove them completely. This will definitely save some room in your pot.